If you are trading without first assuring your survival, you are just playing a game, a crazy gamble that a drunkard places over the weekend in Las Vegas casino. No real trader who aspires to reach constant profitability will participate in the Market without first assuring their survival. The above is absolutely essential and goes without saying. It is assumed by default that your risk and money management, as well as psychological well-being, are taken proper care of. Before anything else, you need the willingness to put in countless hours of work into the Market. Only this will allow you to gain this important subjective feel of the Market as you watch it. The trading ideas will come to you effortlessly and it will only remain for you to execute them. This is how you build your trading system. Ask yourself: “Why am I not putting enough time into watching the Market? Why am I not willing to take losses, make mistakes and yet continue with my method, learning and improving with each passing day?” Find the answers. Write them in your diary. Propose the solution and implement it. Honestly answering these questions in your daily diary will lead to important improvements to your trading system. Go back to the first step – putting countless hours of work – and repeat the process times and times again, with humble understanding that you will never be good enough to cease improving your method and your execution of it. Above all else, remember – it is only possible to go through this difficult process when you have absolutely, perfectly ensured your financial and psychological survival! You cannot be worrying about your well-being or losing more than you can afford to lose AND going through the mandatory learning process of taking losses, making mistakes and being clueless. Price is moved by traders. Traders are moved by feelings and emotions. Our job is to read these emotions on the chart. When traders are under stress their behavior becomes much more predictable, allowing us to profit from their mistakes. When reading Price Action, one of the important concepts is to trade according to your bias before it is already obvious to everyone. You need to look for such price setups where you can already see some hints that the price is likely to move in the direction of your bias. At the same time, there is still no obvious entry setup. At this point we ask ourselves how other traders are likely to interpret the current situation. How do you know that these early signs of reversal are not obvious to everyone else? Simple – the Market is not reacting to that setup just yet – the price is not breaking through support or resistance levels with enough conviction to show that the majority of market participants are trading in this direction. If these signs are not obvious to everyone else, how do you know that these are correct signs? You don’t. That’s the main trick in trading – to act under uncertain circumstances. You want other traders to push the price in your direction, BUT after you are already in the market. We are seeking such a situation where not only there are enough traders who will see similar opportunity and start trading with us, but also there are enough traders who are holding the opposite position at this moment and who are ready to take a loss if the price goes against them. If expecting a bearish move, start trading on a correction, on a bullish failure, on double top, on a bounce, etc. If you wait for the price to break a significant level, you are already too late. The problem with waiting for too many confirmations is that we really can never be sure enough. Looking for confirmations only strengthens your desire to be right, to find a perfect opportunity. There is no perfect opportunity on the market, there is no situation when you can take a trade with absolute confidence that it is going to be a winner. But, there can be confidence that the Market is already providing a great selling/buying price and refusing it is foolish. You see, there is nothing we can do on the market without our fellow traders. On the one hand, you need them to create liquidity and take the other side of your bias. On the other, you need them to move the price to your target after the entry – you want enough volume that will agree with your analysis as well. Whether this volume is generated through new entries aiming for profit, or taking old losses, is irrelevant. One of the most important concepts in trading is following the market. I was always looking at the market trying to predict its future: what is it going to do the next candle? What trade can I place right now? Often I would go back in history and watch some trading pair bar by bar and still make the same predictions. Not only that, but I would actually feel frustration when the market was not doing what I expected it to do. A very good exercise is to watch the market unfold, mentally (or in writing) noting what it is doing right this moment (this candle), and go to the next candle with open mind. I call this market meditation, because it takes all our presence, all our ability to control the thought process in order to just watch what the market is doing instead of trying to tell it what to do. When doing this exercise, I often catch myself surprised after the next candle is revealed. I am surprised because I did not expect the candle to be that way, and yet the whole purpose of the exercise is to stop all my expectations. Why is it so difficult to just let the market be? This exercise also proves yet again that the market can do absolutely anything. It can go in any direction by any amount at any given moment. When we catch ourselves surprised, not expecting the current move that has just been revealed, it is very important to listen inside – to the thoughts that float in our brain and the emotions that we feel. Is there anger, frustration, disappointment? Is our brain trying to judge us because we were not able to “predict” this move? Try to stop this incessant thinking – if there is anything to judge, it is our inability to let the market go, and follow the flow. And yet, there is another side to this. Sometimes we see the market close just as we wanted, and we feel a rush of adrenaline, a pleasurable sensation that tells us we were “right”. In this exercise the excitement is no better than the frustration we’ve just experienced when the marked defied our expectations. Any emotion about the market implies a conscious or subconscious judgement on our part. Remember, the purpose is to watch what the market is doing – without trying to predict, understand or judge. The market is supplying us with an endless flow of information. I believe that we can never deal with this flow constructively, unless we first learn to let it be just the way it is. You can also add any indicators you usually watch – but avoid any indicators that give you a signal to buy or sell. For example, you can add a moving average and then note its position relative to the price chart on each candle. At the same time, do not say that it is a sell signal because the price has crossed the moving average. Remember that any trading signals are not generated by the market, but by our brain – one way or another, for better or worse, our brain has learned to recognize a particular pattern as a buy or sell signal. In this exercise we want to avoid such patterns, because they are nothing more than our subjective judgement. An indicator simply gives us another variable, another source of information for us to note. This is the real purpose of any indicator – to help up clarify what the market is doing right now, not what it is going to do in the future. By far the most important belief on the Market is in myself. Throughout the years I’ve been always trying to perfect my trading system, analyzing each losing trade and trying to figure out what went wrong. I always assumed that any loss means that I didn’t recognize some obvious hint the Market was giving me. I assumed I made a mistake that must be fixed before I take the next trade. That kept me going in circles for many years. The problem with that attitude is that I was believing that it is possible to be always right. I wanted to be always right. In essence, I didn’t have any belief in myself so I was trying to build an ideal trading system that I could believe in. A breakthrough was the realization that some trades are simply not working out. There is nothing wrong with them whatsoever. They were taken at the right time and at the right price in the right direction. And yet, the Market did not go in that direction. When I define “the right trade” or “the right direction” in terms whether the trade made profit I am in for trouble. Basically, I am making sure that any loss will make me “wrong”. A different attitude is to define “the right trade” as the trade that has been taken according to my trading system, without any anxiety or hesitation. The trade might still lose me money, but it is “right” because it wins in the long term. Even when the trading system is not good enough to give me a winning edge, the trade is still “right”, because by following my rules I will soon find out the problems in my system and improve it. On the other hand, when I judge every losing trade as “wrong”, I will experience emotional pain. If a trade is capable of causing me pain, disturbing my emotional balance, I will soon develop a fear of taking a trade. When I start hesitating pulling the trigger, my belief in myself is further diminished. Before I know it, I am trying to improve my trading system again, trying to make sure it will never lose and become the Holy Grail I can believe in. Until we can fully believe in what we are doing we can never become consistent in trading. If there are no rules in your trading, you are going nowhere. If there are rules in your trading, which you constantly adjust to make sure the Market does not cause you emotional pain, you are going in circles still. We have to change what’s inside before we can start seeing what’s outside clearly. Someone who is watching the markets for considerable amount of time learns to see certain patterns almost automatically. Oftentimes we do not even have to name what’s going on in the market, we just know that the current Price Action looks like something we would want to Sell or Buy. There is nothing bad with learning to recognize certain patterns and use such recognition to read the Market. The issue lies in closing our eyes to everything else the Market is showing us, as long as our favorite, easily recognizable pattern is present. I’ve been watching the markets for more than 11 years now and all this time I’ve been mostly contrarian trader. I would look for opportunities to Sell at exact highs and Buy at exact lows to get great Reward/Risk ratio in these trades. Of course, I realized that the chances of such trades following through are not very high and that such trading opportunities are not provided by the Market often (especially on Daily charts). However, I kept reminding myself of the great return such trades could offer and kept concentrating on them nevertheless. For many years my main problem was giving up too early. When you start fading a move you have to be ready for a couple failed entries. There is nothing more frustrating than giving up on a trading idea after 2-3 losses and seeing the Market follow through according to your exact scenario – without you. As I studied Price Action and, much more importantly, psychology, I was able to stick with my trading ideas longer and started generating profits out of them, riding some really nice trends. I accepted the reality of the Market – that it can do anything at any given moment – and would be contempt when my idea did not work out. As I kept on trading and analyzing my successes and failures I started noticing how rarely valid contrarian opportunities (supported by Price Action weakness) were available. Additionally, I noticed how often I would fade the trend, get my small loss (compared to potential profit) and see the trend continue without me for another couple days or even weeks. For a while I did not even see any problem with that – I just thought of myself as a Contrarian Trader, and was pretty happy with overall results of my trading. However, through constant analysis I could not help but notice how much potential I left on the table by not even considering going with the trend. To me, any time the price is coming to Support or Resistance is a trigger to consider fading such move. Naturally, there are many filters that I developed over the years not to get into obvious traps, but the point is that fading the move is the only possibility I would consider. If I saw that a breakout is likely I would just forget about that setup and move on. 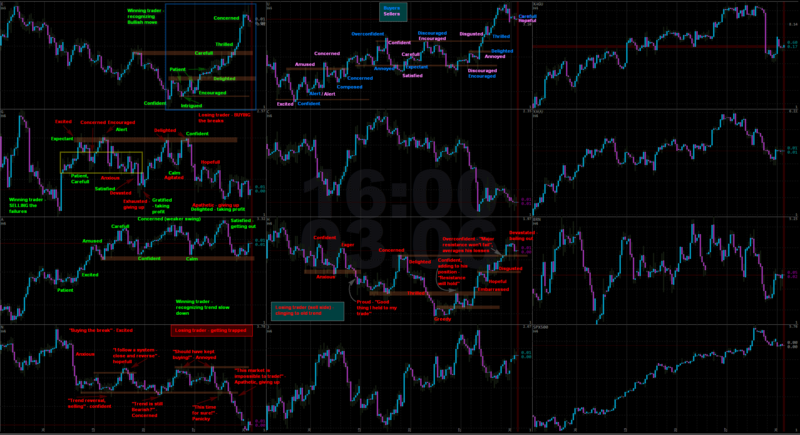 Finally, I started reworking my trading system and adding new setups into my arsenal – with-the-trend setups. After spending a couple weeks going through history I identified valid patterns that I wanted to include into my method. I then proceeded with my trading, now looking for these trend setups as well. I thought that because I defined what good with-the-trend entries look like I should be able to jump on a couple soon enough. However, what happened next was quite surprising. Because of constant work on my mindset and psychology I was not afraid of losses. I also realized that my Trend Setups may not be of very high quality, so I was ready to rework them as necessary, after analyzing a couple live Trend entries. I simply did not see where the problem might come from as I was ready for anything, except… In the next couple weeks of trading I did not find a SINGLE trading opportunity with the Trend! I kept taking my contrarian entries pretty actively, with about the usual degree of success, so I still saw patterns and took trades. But for some reason I just could not find any Trend entries whatsoever – at least not live. Naturally, I kept analyzing my performance, taking notes about each live entry. I then saw that almost every time I was analyzing a failed contrarian entry where the price was breaking through and continuing with the prior trend, it looked exactly like one of my Trend setup pictures that I prepared. After seeing quite a couple of these extremely clear (in hindsight) Trend setups I started wondering, why the heck didn’t I see a single one of them live? I’ve been watching the Price Action on that exact trading pair very actively, trying to find an entry to fade the trend, but I just did not see the opportunity to follow the Trend, even though it was right in front of me and looked exactly like one of the setups I have prepared. I finally realized that after all the years of trading the markets in my particular style I became completely blind to any other information the Market was trying to tell me. I would see only what I wanted to see and ignore everything else completely. Mark Douglas is sharing a very interesting example in “Trading in the Zone”, Chapter 10 (p. 179), where he decided that he wanted to start running. Initially he met extreme resistance just getting out of his apartment and starting running until finally, after great effort and struggle, he “became a runner”. He started thinking of himself as a runner, seeing himself as the runner. Running was something he was not just doing now, it was something that was very natural for him to do. There was no more mental resistance whenever we wanted to run. Just like Mark Douglas has become a runner, I have become a “Contrarian Trader”. It was not easy, and I struggled for years to be able to fade the trend comfortably, but at some point most of the resistance just went away – fading the trend was something that was very natural for me to do as a Contrarian Trader. Trading with the Trend on the other hand, wasn’t. Through many years of hard work I have developed a trading style that was easy for me to follow. However, now that I realized the limitations of trading in only this style, I wanted adjust it. I did not want to become purely Trend Trader, but I wanted to develop a more universal approach, allowing me to look for opportunities during the rejection of Support/Resistance but also when the price is already trending from one S/R zone to another. Unfortunately, recognizing the need for a change, even recognizing what exact change we want to achieve, is not enough to achieve it. Now that I defined a new mental picture of how I wanted to trade I knew what kind of mindset I wanted to develop in order to become proficient trading the new Trend setups in addition to my Contrarian setups. Implementing such a change of mindset turned out to be a pretty complex task. After some additional mental work I started seeing Trend setups, but the resistance to act upon them was still great. My brain would quickly find one hundred reasons why I should NOT take a particular Trend setup, no matter how good it looked originally. After recognizing the hesitation problem I started pulling the trigger on more and more Trend setups (almost forcing the decision sometimes). Next issue was holding the Trend trades. While I would be able to fade a trend and ride the trade in the new direction for weeks, comfortably sitting through heavy draw downs in my floating profit, I did not have any confidence in riding the trend if the trade was initiated with one of my Trend setups. Any time the trend would show some kind of correction, I would see a Contrarian entry possibility. Even though many of such possibilities would be filtered out and I would not establish a position to fade the trend, just seeing one contrarian pattern was enough for me to close my with-the-trend entry. The experience I went through showed once again that having a good Trading Method is not even 50% of our success. In addition to having the edge in Market Analysis and finding good Entry Setups, one needs to develop a proper Mindset that will allow him to trade such method without any resistance. Most traders consider that Trading Psychology is about hesitating pulling the trigger, or worrying too much about an open position. My experience shows that sometimes our brain can simply block out all information that it is not comfortable with. If our Mindset is not developed to work with our Trading Method, we can be assured that the brain will find most elaborate tricks to ruin all chances of our success. We may believe that trading as about Market Analysis. We may believe it is about being right and knowing what the Market will do next. Some believe it is about statistics (and there is some truth to that, in my opinion). But in the end, trading the Market is about people. People make decisions and these decisions move the price. People are extremely susceptible to mistakes. People, in general, have huge ego that is telling them what to do. Studying Human Psychology can help us to understand people better. We don’t need to have a masters degree in psychology to trade, but we need to be self-aware and willing to analyze our every thought, decision, action. We also need to be willing to empathize with other traders – be it small speculators (like most of us), large commercial traders, non-commercial businesses that just want to hedge their risks or huge multinational banks that really have the capacity to move the market. They all have their own goals, desires, biases, emotions. They all make mistakes. Understanding this, not only we can be more open to searching for our own mistakes but also we will understand the psychology of other traders and will be able to profit from the mistakes they make as well. As I am doing historical Price Action and Strength analysis I am seeing a lot of great opportunities that I was watching live and missed nevertheless. I can see clearly that the Market is providing me with a couple great entries every single week, and yet I am not acting on many of those. Naturally, when I look back, I make pictures only of great trades that I missed and so I fail to realize that there are many signals that look just as great in real time but would lose money if acted upon. This goes to show that picking out trading signals is a losing proposition on the whole. We must act upon anything that looks like an entry trigger in the potential long term direction. Really, when we come thinking about it, how else can it be? Any entry trigger is uncertain. It can never be a 100% indication of a profitable trade ahead. It is just an indication of a familiar pattern that is utilize in our trading system. Any future trend is only potential. It can never be certain, we can never know how the Market will behave in the next couple days. This simple procedures assumes that all Money and Risk management is taken care off, and one should never even approach the markets without it. After all, this is the only area of our business where we can achieve some certainty. Whenever I look at a price chart I want to make sure that there is no rigid preference in my mind for it to go in whichever direction. If I happen to “know” where the Market will be going, I am setting myself up to a failure in the long term. And still, I do know something about the market. I am certain that the Market will move, and it is about the only thing I can trust it to do. It may take its time, but eventually it will move sufficiently enough up or down to create an outcome for my trade. Before I even think about placing any trade, I want to build an acceptable scenario how the Market will be moving up as well as how the Market will be moving down. I am building these scenarios fully acknowledging that the Market does not know about them, could care less about them, and ultimately will move only in such a way that it needs to move in. I then accept the possibility of either scenario to work, and in case my (limited) understanding of the current market situation suggests that one scenario is more probable than the other, I establish the trade. What’s so great about the market, is that it is a great teacher, and it never hesitates to provide clear, unbiased, very useful feedback about my trading decision. Soon enough it will show the reality of the current market situation and I will be able to compare it with the possibility that I outlined in my trading scenario before establishing the trade. The actual outcome of my trade is completely irrelevant. What’s important is the feedback I get each time I choose to participate in a trade. Trading in this way, I am making the Market my most valuable ally, instead of trying to make an enemy out of it. It teaches me, guiding me to greater understanding of its actions. Really, all the Market is trying to do is tell us where it is going. Unfortunately it does not speak English, and so it is our only job to learn the language that it does speak – the language of Price Action. However, like with any other language, we cannot perfect it by concentrating on just the theory – we have to engage in a conversation with the Market by establishing a trade and learning from its response. When anyone who knows about Your Trading Coach, reads back into my old blog posts, it should become obvious to them that my understanding of Price Action was heavily influenced by Lance’s approach. Even though my trading system is mid to long term, I am reviewing his Price Action articles anytime I feel like I cannot read the current market structure. I am very pleased that he decided to show some of my trades on his blog, so that his readers can see that the same principles apply to any market, on any timeframe. I would like to emphasize, that when I say his blog influenced my understanding of the market, I do not mean that I read it once, had an “a-ha” moment and realized how to trade profitably, never to lose again. The only reason his writing is helping me is because I am coming back to it every single week – not only to read his new article, but to look through the old posts in all categories that he writes. We do not learn by reading some idea once, we learn by systematically reminding ourselves the important principles in that idea and applying them in our daily practice. If you read “Market Wizards” by Jack Schwagger, you will note that the best traders in the world are constantly improving by learning from other professionals in the field. I do not recall a single interview in the book where the trader would not show his respect for other’s work and would not acknowledge the fact that he is still learning from other traders, books, market newsletters and of course the market itself. It goes to show that no matter how successful a professional trader is, he still needs to constantly learn and improve. Eleven years ago, when I was just starting getting interested in the market, I was believing that I need to learn for a year, possibly two, and then I will just enjoy trading my system and spending the profits. Now, more than a decade later, I am learning much more than when I started, spending more hours each day on learning (certainly spending more time studying the market than actually trading it) and only recently starting to open trades in the right places. I came to realize, that the essence of anything we want to do well in this life, is in constant studying and practice. There is no point where we can stop learning and relax. Instead, we relax by enjoying the learning process, constantly fascinated by the infinity of knowledge we are yet to learn. Part of my everyday trading process, is reading selected market books. Along with new books I add to my library every couple months, there are some that I continue reading every single day. 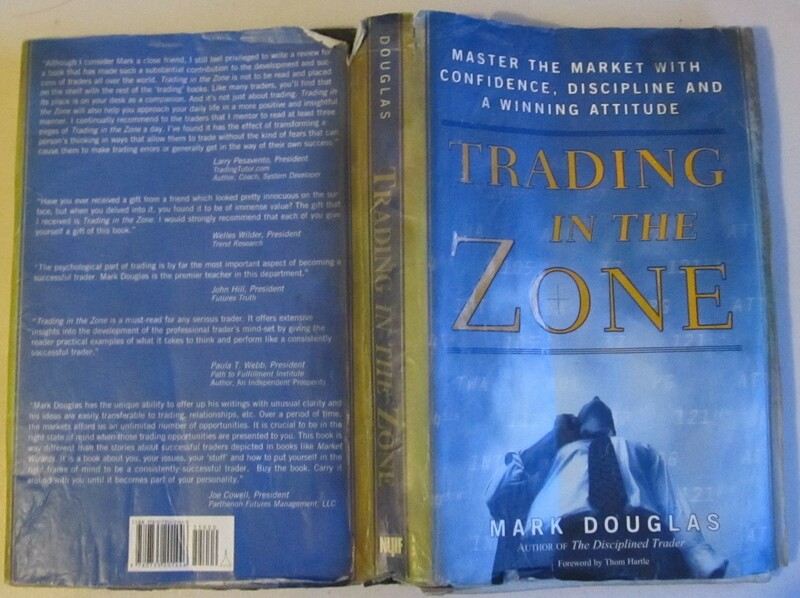 “Trading in the Zone” by Mark Douglas and “Market Wizards” by Jack Schwagger are only two examples without which any progress in my trading would not be possible. I have read “Trading in the Zone” in Russian when I just got interested in trading eleven years ago, but unfortunately I could not see how it will help me to make any money trading. I put it aside, and continued pursuing more “Holy Grail” trading methods, confident that I will find the one that NEVER loses – why do I need any trading psychology then? Nine years later I was still learning about the market, developing new trading systems, still unable to make any consistent profit, still not finding the “Holy Grail”. Realizing that I am not getting anywhere I started looking for answers, and noticed the book again on Amazon, while shopping for new technical analysis bibles. I bought it in English about a year and a half ago and it made all the difference for my trading performance (I was very lucky to stumble upon Lance’s blog about six months later as well). 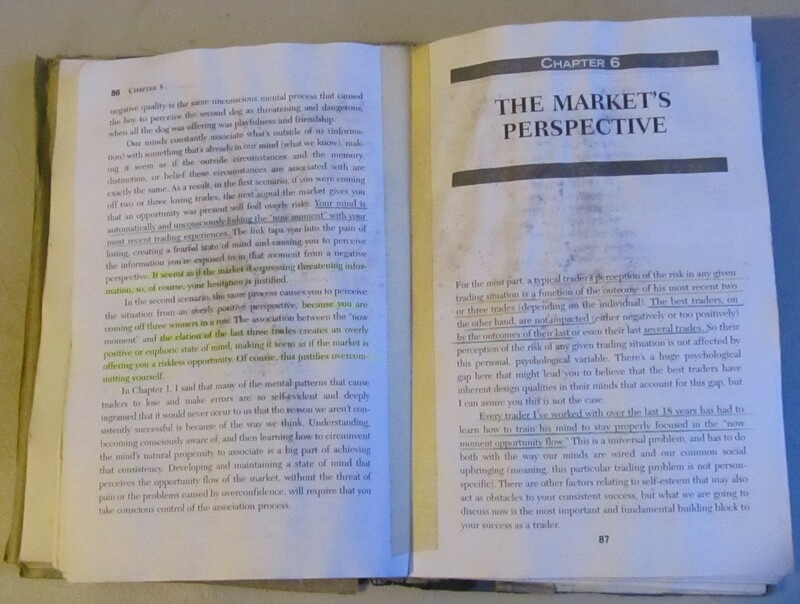 Since then I have read “Trading in the Zone” fifteen times, taking notes, highlighting important parts. I cannot emphasize enough how many new insights I am getting with each new reading. Every single day I put a timer for 10 minutes and read it again. Today I am on page 87, and as soon as I am done, I simply go back to page 1. I am not trying to say that this particular book or Price Action based trading system is a “Holy Grail”. Instead, I am saying that the attitude of constant learning and improvement, such as you can clearly see in Your Trading Coach blog, is that illusive “Holy Grail” that every trader is trying to find outside, not realizing that it’s always been inside – hidden by our ego and only waiting to be developed.